Sometimes, a winner needs to ramp up his thoughts. 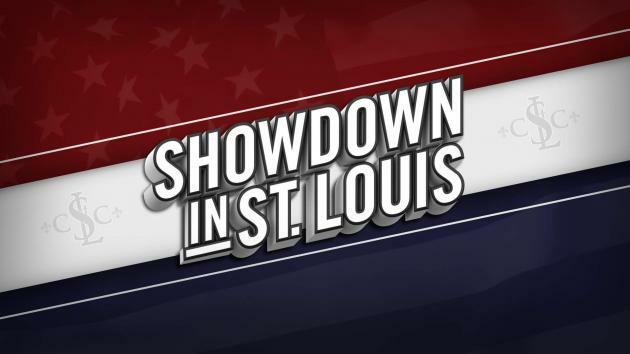 GM Fabiano Caruana to Chess.com on winning the Showdown in St. Louis? First: "I didn't consider myself a huge underdog." Later: "I played above my expectations...I think I probably surprised more than a few people." Then on the live commentary: "I was dominating the match today." All statements were true, but there was one member of the team that didn't need time for his emotions to manifest: manager IM Lawrence Trent. "I think he's happier than I am!" Caruana told Chess.com. "Doesn't it feel good!?" -- Manager IM Lawrence Trent's first words to GM Fabiano Caruana after he clinched the match. Today he didn't even need the extra point he'd bagged from the opening three days of the Showdown in St. Louis, hosted by the Chess Club and Scholastic Center of Saint Louis. Caruana won the blitz portion 4.5-3.5, and coupled with his performance in the rapid yesterday, the final margin became 10-8. He took $60,000 while Nakamura "settles" for $40,000. In the undercard, GM Hou Yifan easily wrapped up her annihilation of GM Parimarjan Negi. She clinched the match win halfway through the eight-game Sunday series. Caruana returns to the club to play his final two games, but the match had been sewn up. "I think blitz is mainly about form," Caruana said. "Hikaru wasn't playing his best or at least close to his best today. "I'm very happy with the result. I hadn't had a good year, to put it mildly." He won in Dortmund, but this event, even devoid of classical chess, meant more to him. "A match somehow has more meaning. I wanted to show that I can work well at faster time controls, especially against Hikaru." Nakamura got sick at the beginning of the event and could be seen coughing the entire day. He said he had a premonition today would be a long one. "[I was] playing blitz this morning on Chess.com against someone significantly weaker than Fabiano and I was just barely winning," he said. "I had a bad feeling about today." He said this is not a normal practice, but he was searching for ways to turn around yesterday's subpar results. "Today I just didn't see tactics." Indeed, that could be surmised early in the introductory game. Nakamura was plagued not just by health but by an errant opening strategy. He wavered from theoretical openings until his final game (a win as Black). "I thought he would mix it up a bit," Caruana told Chess.com. Nakamura struggled to find the right balance between keeping his opening ideas protected while competing at his best. "My whole strategy was wrong," Nakamura concluded. "I tried to avoid playing my main openings. I just wasn't using my brain. "What I'm angered about is that I avoided playing the Berlin until the end of the match," he said. Players got about a 10-minute break between rounds as the broadcast preferred to only show one game at time (the other match would then play). Both players agreed this format helped the winner. Caruana explained that in most blitz events, games are back-to-back. Trent was yelling at his charge, through the screen, and apparently some of his Britishness has filtered into Caruana's speech. Last year, Nakamura used the blitz portion to create distance between himself and GM Levon Aronian. He also previously won a match in St. Louis against GM Ruslan Ponomariov in 2011. Round three also helped prove Nakamura's claim that his tactical monocle had fogged up. Nakamura threatened to make a run after winning what seemed to be a worse knight ending. Caruana's queen trade netted him a free b-pawn, but Black had seen more: the knight had no escape. Round five saw a unique ruling that could have become controversial but turned into only a minor issue. With Caruana advancing his pawn to c1 for a promotion, he hit his clock before replacing the pawn with a queen. Normally this is a loss (a sort of illegal move) but in real time arbiter IA Tony Rich saw that Caruana had accidentally hit the clock while reaching for the queen, which was located behind the clock. Here's the exact moment when the transgression occurred. That's Caruana's blurred hand holding the "extra" queen, with his clock accidentally depressed. "I didn't know I pressed the clock," Caruana told Chess.com. "I (eventually) realized I had brushed it (while reaching for my queen)." "[Caruana] reached for the queen and as he was doing so hit the clock unintentionally," Rich explained. Nakamura accepted the decision without complaint. "If I had forfeited, that would have changed things completely," Caruana told Chess.com. Arbiter Tony Rich gives Nakamura the few seconds back lost. After resumption, Nakamura offered a draw, which was declined, but then he held anyway. Game six was Caruana's first chance to end the match, and he did just that. The win gave him a three-point lead with only two games remaining. This time Nakamura's king walk was just too much aggression. Nakamura said afterward that like this match, the London Classic will feature some departures from the norm -- players like him want to keep their Candidates' Tournament preparation hidden. "As soon as Moscow was announced, your whole mindset changes," he said. "I let that affect me too much." When asked by Chess.com if he and Nakamura can still work together in upcoming national team events, Caruana smiled and said, "Yeah, I think we'll manage." Hou Yifan had no such drama today. She went back to her bread and butter. After four Open Sicilians yesterday, she played seven straight today, for 11 in a row (only a last-round Caro-Kann, perpetrated by Negi, broke the streak). GM Hou Yifan wasn't worried about holding anything back before her March 2016 women's world championship match. Coming into the day up three points, she drew games one and three but won two and four to quash any chance of a comeback. Game two was particularly dramatic. Negi got down to one second twice and rallied back to equalize and even become better, but the former women's world champ used some king-and-pawn moxie of her own. Then a tragedy for Negi -- he pounced to win a piece, then let White liquidate the kingside to earn equality, then he flagged to cede the game and the match. Like Nakamura, Negi mitigated the match loss by finishing well. The Indian GM picked up three draws and a win coming home, making the final score 11-7. Like yesterday, Hou Yifan still expressed desire to up her game. "Compared to the top players, I see they are more well prepared," she said. Hou said this won't be easy with all of her studies, but she thinks she can do it. She also offered some thoughts on the women's world championship. She said she wanted the process to be the same every year instead of flip-flopping between a match and a knockout. She said copying the men's system would be just fine. Should the women's world champion be given a chance to enter the men's cycle? "That sounds wonderful! I like your idea!" she said of this hypothetical. Hou told Chess.com that the overall world championship may be out of reach for her, but getting into the top 50, then 20, then 10 would be good goals. What else competes for her time? Hou said she enjoys reading, watching television, touring cities she's playing in, and movies. Her favorite movie of the past year was "The Imitation Game," but when told that several characters like Hugh (C.H.O'D) Alexander and Stuart Milner-Barry were chess players as well as codebreakers, that piqued her interest. She also revealed that one of her all-time favorites is "The Shawshank Redemption," which also features some chess scenes. Maybe there's something subliminal going on! One final note on the main event -- could this all diabolical plot? Nakamura said he'd trade all his bad form here for a win in the Candidates'. That begs the question: Could he have been sabotaging the match by either playing bad openings on purpose or dropping games to give Caruana unreasonably false confidence for their two meetings in Moscow? This is not unprecedented in sport. Hall of Fame pitcher Greg Maddux was said to employ the "Bagwell Gambit" -- intentionally throwing weak pitches and giving up home runs to Astros slugger Jeff Bagwell in games that didn't matter, in order to set him up for a strikeout in the playoffs. Those who know Nakamura know that this could not possibly happen. He's too much of a competitor, no matter the stakes. And it turns out, Maddux was too. As great of a story as it is, it likely never happened.